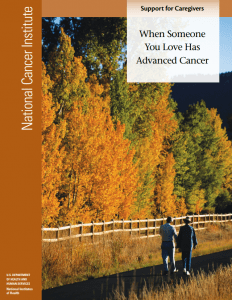 This booklet explores many of the questions and crossroads that face caregivers when their loved one has been told that he or she has advanced cancer that is no longer responding to treatment. This booklet is for you if your loved one has been told that he or she has advanced cancer that is no longer responding to treatment. It explores many of the questions and crossroads you may be facing now. Until now, you have probably gone through cancer treatment with your loved one hoping for a remission or recovery. If your health care team is telling you that this may not be possible, you may be facing new choices to make about care and future steps. Making these transitions in care can be hard. You’ll need to focus on the things you can control and what you can do to make this time with your loved one special. You’ll want to help the patient live life to the fullest. Many caregivers say that this time gave their life special meaning and a sense of what’s important.